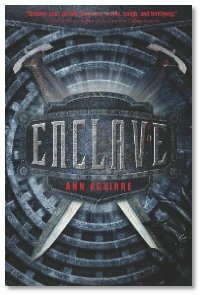 I was given a promotional copy of Enclave. It is the first book in a proposed series. Enclave deals with the aftermath of a zombie apocalypse in a world where those people who are trying to maintain civilization are all very young with a life expectancy of only their early twenties. I remember in one of my history classes, the professor trying to explain the reason for the wacky behavior of the middle ages, and his theory was that the bulk of the population was very young -– that there just weren't enough older people around to put the brakes on. As I get older, I find this theory kind of comforting. It is good to have a purpose -– even if that purpose is to act as an anchor. So what kind of society is created when for generations the oldest person around is twenty-five? Oh, and when society has been forced to live in subway tunnels to escape the ever present hunger of the zombies? (Called Freaks in the novel.) Ann provides a thoughtful description of her sources at the end of the book. I must be the only person around who hasn’t read The Hunger Games, so while others have made the comparison, I can't tell you how the book stands up. But the story -- written in the first person -– features an engaging heroine called Deuce. Deuce has worked her whole life to become a Huntress, one of the members of her community who will venture out into the tunnels to find food and defend the group from Freaks. As a newly blooded Huntress she has an expected lifespan of four or five years. Her world has many rules, all designed for the survival of the group. Deuce doesn't like the rules, but she understands their purpose. Even more, she understands that breaking the rules will mean exile and death at the hands (and mouths) of the Freaks. Deuce is paired with an outcast hunter called Fade and together they discover a terrible threat to their group. One that the "Elders" disregard and punish them for finding. Deuce and Fade are exiled and make their way to the surface, and to tell you anything more would be way too many spoilers. The story is fast paced and involving; with thoughtful questions about how we build our societies. I can certainly see it being taught in school, in much the same way that Lord of the Flies and Canticle for Leibowitz are. I’d certainly think that this book would be enjoyed by any fourteen year old and above with a taste for zombies.